Thanks so much for stopping by today! If you came from Catherine's blog, you're in the right place! And you know what?! It's totally okay if you're here just for the chance to comment and win prizes. Cause.....I would totally do the same thing LOL! 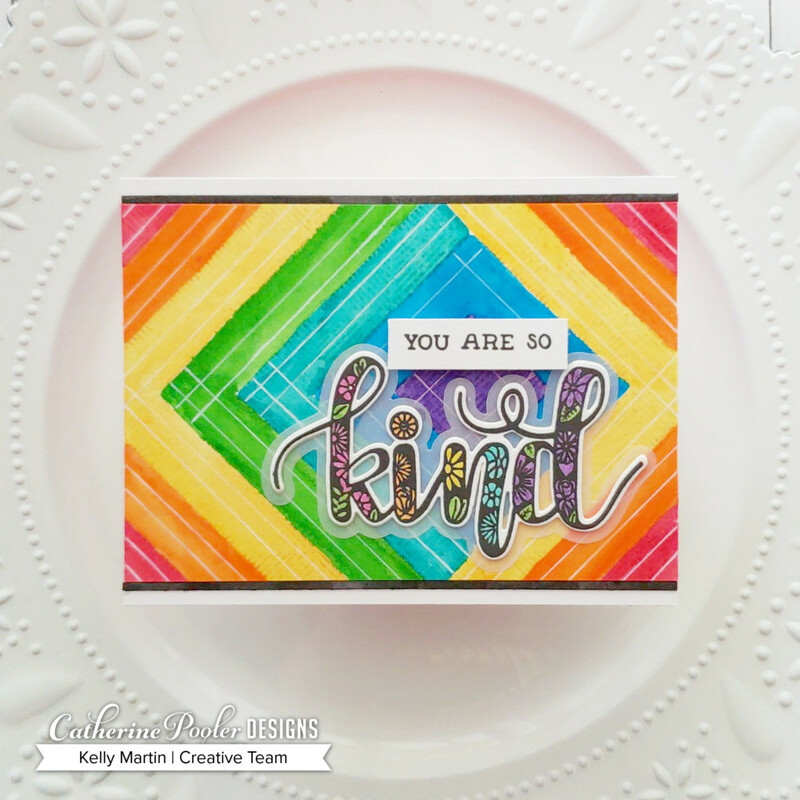 Today I'm sharing two more cards featuring products from the newest release, and you can find the entire kit and caboodle of awesome products right here! Are you a DIY-er? I'm not really.....to be honest, I spend so much time crafting that the thought of coming up with other ways to do DIY stuff around my house makes me want to take a nap! But you can combine the DIY mindset into the crafting mindset and guess what you get? Just take your leaf dies from the Hello Autumn set and die cut them repeatedly across a piece of 4.25 x 5.5 inch cardstock and, voila! You've got yourself a die cut background made from your DIY cover plate. Start off by creating a background of some kind (I choose to create a watercolor background from various Catherine Pooler inks), and then mount your die cut background piece with foam tape, adhere it on to your watercolor background, and you'll be set to go! Just add a sentiment (I chose to emboss a greeting from the stamp set on to a strip of vellum), and then you've got yourself a beautiful card! One additional thing I did on this card was stamp the inside layers of the leaf images with the new Twilight ink, to give some added depth and dimension on the leaves. I also added a bit of twine to tie in the gray shades on the leaves. Okay next--who doesn't love a good rainbow card?! This card was so much fun to make, and it was REALLY easy! I stamped the Angled Squares background stamp on to a 4.25 x 5.5 inch piece of watercolor cardstock with a light water-soluble ink. I then smooshed various CP inks on to an acryllic block, picked them up with my waterbrush, and then painted them on to my cardstock, following the lines of the stamp to create the bands of color. After the background was completed, you can kick it up a notch and add some details with a white gel pen! I stamped the "kind" word from the Kind of Wonderful set and then colored in the tiny floral images with sparkle markers, and then I used the Three of a Kind die to cut out the word before gluing it on to the shadow piece that the die cuts out. I chose to cut my shadow piece out of vellum. I adhered the entire kind word (with the vellum shadow piece) on to my background, and then chose to add a couple words on to a separate white strip and glue that down as well. I then trimmed down the panel a bit and glued it on to a cut and scored 4.25 x 5.5 inch card base. At this point, you can add a finished edge along the top and bottom of the rainbow panel however you want! I chose to tie in the black sentiment by adding strips of black washi tape. Thanks again for joining us on another day of blog hops! Hop along to each blog today and leave a comment for a chance to win a $25 gift certificate to the Catherine Pooler Shop! Winners will be announced on Monday, August 20. I wasn't sure about the background stamp but you made it really impressive and opened up my mind to other possibilities! I am not much of a DIY-er but I am working on a few monogram pieces to put onto one of my walls in my craft room (but it will take me forever to finish! lol). Great cards! Love the rainbow, of course! And the 'kind' word w/florals is so pretty! Clever way to create the rainbow background. Great cards. Love both cards, fun to see different ideas . Love the colors on the rainbow card. I love how you show us how to think outside the box! I'm just not creative enough to come up with these things on my own! Love the DIY idea. So much elegance in the hello Autumn card! Beautiful cards! 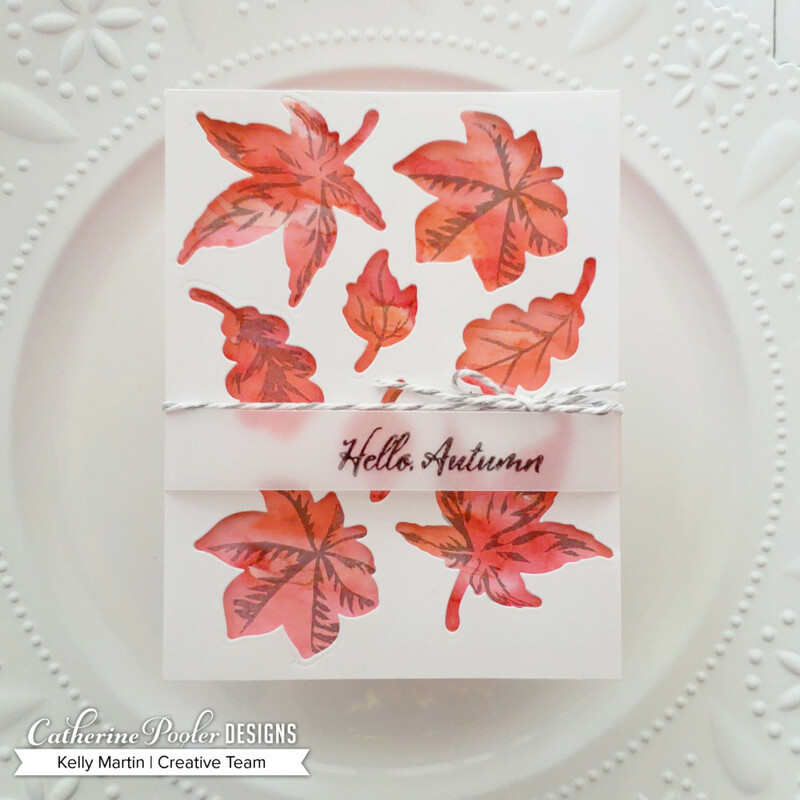 Love your autumn leaves and the gorgeous colors you used! And the Kind of Wonderful set is awesome! Beautiful cards! :) I love how colorful the second one is. Both cards are fabulous! Love the idea of your DIY cover plate! 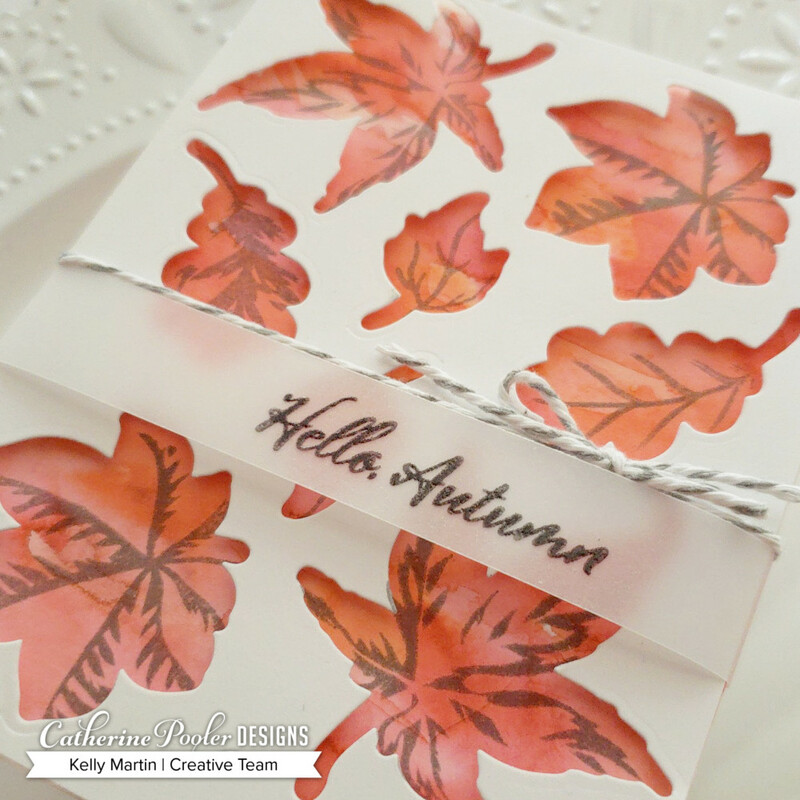 Your autumn cover plate is a great idea and looks like fun to replicate. The rainbow card made me feel so happy! Love the colors you put onto your cards. Love the leaves too. Thanks for sharing and have a wonderful weekend. Some great ideas and so beautiful. Love your rainbow card. Thanks for sharing. I love what you did with the background stamp Kelly! Super fun! Clever DIY background die. Love this idea. You’re absolutely correct, who doesn’t love a gorgeous rainbow design. Love the design you got with the angled background stamp. Love your rainbow background. The Angled Squares stamp is my favorite from this release! Fun DIY idea. Beautiful cards!! I love how you were thinking outside of the box. Very clever! Pretty Autumn card and love the rainbow colors. Pretty cards - I love how you colored the kind in the rainbow card. Great cards and lovely colors used. Love those leaves, and that rainbow background in amazing. Great cards. I love your autumn cards they are so vibrant with colors that are beautiful.Thanks for sharing your cards with us. Lovely and fun cards! Just fantastic! That kind die . . . amazing. Beautiful cards. Beautiful cards! Thanks for sharing your ideas. Gorgeous cards! Thanks for sharing your ideas and being apart of the wonderful release.